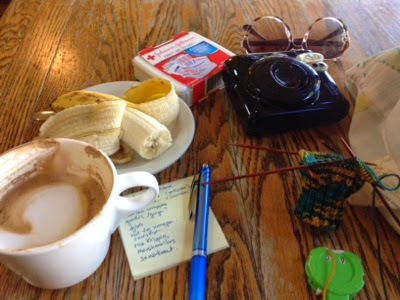 Perhaps my cafe table looks more chaos than calm. However it is a moment to refuel, knit, charge my phone, and dither all at once, alone, before I go on the combined 5th grade field trip. Good times now, fun times later. I'm joining Carole today. 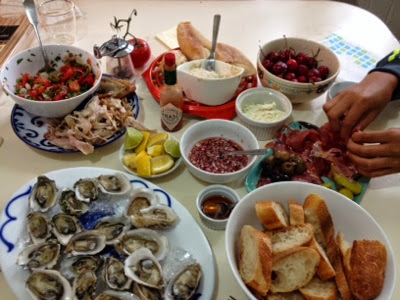 The "Ten on Tuesday" topic is perfect post Memorial Day Weekend (like the gorgeous shot of her grilled hot dogs -- insert my food hankering here). She used the "B" word in her post so now I also feel compelled to make brownies. 2. 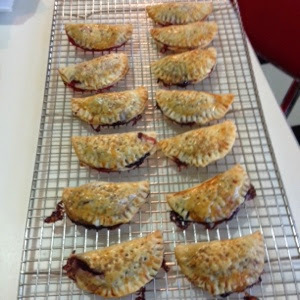 Made mini jam and Nutella pies again. A few tiny chopped up pieces of strawberry make it extra tasty. Can you tell I have tendency to overfill my minis? 3. Made Snickerdoodles. 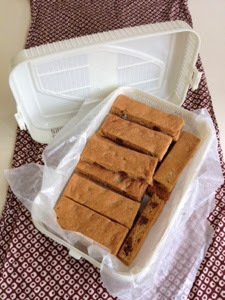 I froze some of the dough to experiment with thaw times for prepped baking. Do you guys do this? 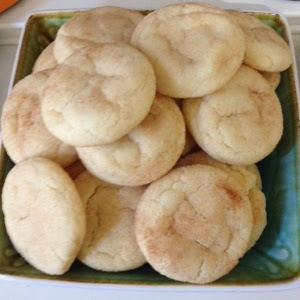 I do it with slice and bake, but I have never done Snickerdoodle before. 5. The Kid and I had friends over to play on Saturday (which is what I made 2 & 3 for). Technically he had friends over and then whatever families could make it at pick up stayed for some wine, table kitchen dinner and chat. It was really nice. The Manfriend got home in time to keep me from over cooking the salmon. We even had 2 little sisters, which is a treat for us. We are usually surrounded by a lot of boy energy. 6. Went to visit my Sister's family on "The Island" as they've taken to calling Alameda. They had just finished up baseball practice and we grilled up some chicken that we ate with cucumbers and sticky rice, Thai-style. We laughed about our funny little boys. I finally delivered "The Green Thing", this giant stuffed frog my Mother sent for the little nephew. He loved it and it instantly wrestled with his Giant Green Gorilla.We had a good laugh how Mom will send things to me for my Sister and send things to my Sister for me. Not on accident. I think she's just combining shipping and forcing us to see each other, ha! Not that we don't like each other. Dad and StepMom couldn't make it (we were last minute planning ... again and they had plans) but we had family spirit for them, for sure. 7. I took a Zumba class for an hour and 45 minutes. It was supposed to be an hour and a half, but she did a few extras for us. It was a special Memorial Day class at one of the gym's other (fancier) locations. I was exhausted. I think I will have a side of Advil with my dinner today. 8. 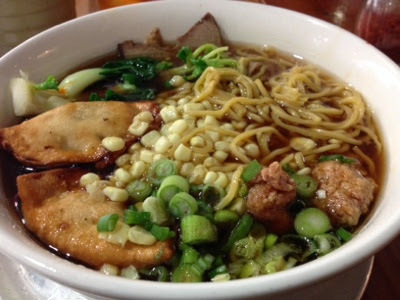 I ate a bowl of Ramen in Japantown at Suzu after class, by myself and read the Guardian and had a glass of unsweetened Iced Tea. It was magical. 10. 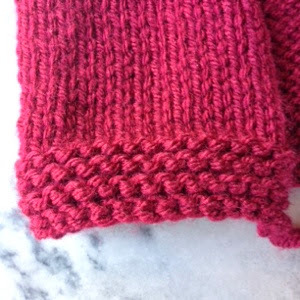 I finished knitting and weaving in of Baby Sophisticate. Alas, I couldn't finish it off because I didn't have enough/right buttons. Garter edge detail of baby cardigan #2. There is still much to be done. 2 sleeves, a shawl collar and a button band that will not get done tonight (PTA Meeting) or tomorrow (Middle School Family welcome night avec ice cream social). As I was commenting at Woolythyme, it seems like I know a lot of people coming down with a case of the babies! This co-worker's wife is also due any minute. Thankfully I have his mailing address, because I don't think I can beat the baby for this one. Wow that sounds horrible, but you know, finish on time. I am in general knitting this Go To pattern with some decent pace (at least for me) probably because I'm imagining knitting socks or other grown people accessories and apparel in the not so far future. ... but wouldn't this sweater look great with a hat?? I really do just make it harder for myself don't I? 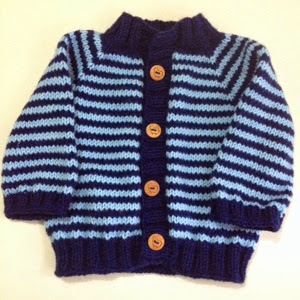 Lookee here, it's the Baby Harrigan sweater. 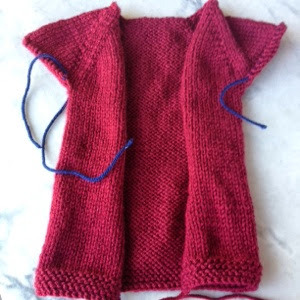 Size: 12 mos - did it really knit up that size? TBD it's been a long time since The Kid was a baby. 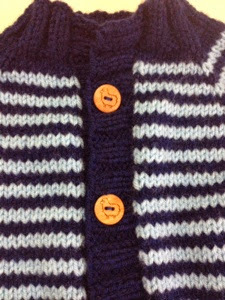 I like a cardigan pattern for the Small people. I feel like their ginormous head/body ratio is kind of overwhelming, even when they can actually support it. It's nice not to have to pull a bulky sweater over them. Also, the small people come in all shapes and sizes and grow at different rates just like the rest of us and a cardigan allows you to get a little more life out of it unbuttoned. This also plays to my reasoning of always knitting a large size. Everyone seems to have a million layette items, but what about when the kid can actually go out to the park for some basket swing time? Notice the button detail. Yes, those are sheep. ha! The sweater is acrylic but you know I'm a fan of the easy care and softness of the Knitpicks Brava worsted. 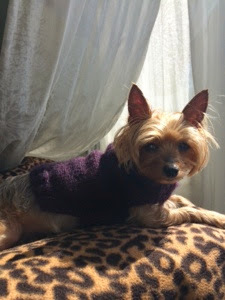 The lovely and delightful Katiebee, of Life on Coyote Hill Continues ... She was declared our winner by the random number generator Tuesday morning. I sent you a ravelry message earlier this week, Katiebee! Now, if you didn't win, don't despair. June is around the corner and I'm going to have TWO prizes. I know! These things that whirl in my mind ... they could give me a clinical diagnosis of something that my whole family suspects. Rhymes with hazy, ha! I am just a haze and fog of thought. I have partial lists floating, but it seems I feel sort of partial in a lot that I'm doing. My last post was really slapped together, my sentences more stilted than usual. I was so busy this weekend so I posted completely using my phone. It's not as easy to include links and detail using the phone, so I apologize. This may be one of those examples where I have been spreading myself a little too thin. It was a fun and good busy weekend but it was a back to backer for sure. So now I will try to round up and weave-in some loose-ends. A new favorite savory breakfast: Kepanie made eggs with green onion and pancetta and served it over rice. Brilliant. I like cheesey eggs as it. The boys put it on a piece of toast, but the rice speaks to me in secret loving comforting mom tones. Making good on: Baby sweaters, fer reals. I bought buttons today at lunch and I see a sweater FO picture coming your way hecka soon. Pink socks. Though I should've cast on that other baby project. I had to see if I could make some more tracks. I think I messed up one side a bit. After a season of being undefeated The Mad Dogs lost their first match, badly. But the kids were in good spirits. 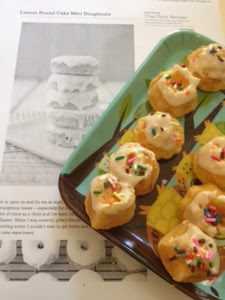 The kid and I worked on some new recipes. The Kid went to a sleepover with a few hundred children at Lady H's. The Manfriend was given a few hours to himself after his Saturday shift and a trip to the gym. Denise and I went to see Smuin ballet with some tickets I won at the school fundraiser. 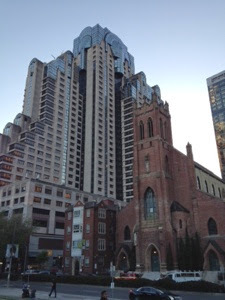 This was one of the sights we saw on our way to the Yerba Buena Center. Today was a family revelry at the mother in law's. No photos, for too much fun was happening. 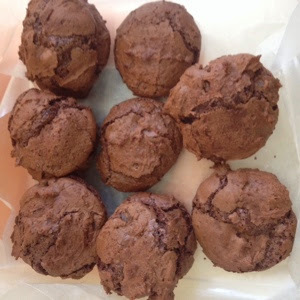 A Malabrigo May Give Away and Whoopie Pies! Happy Monday! Happy Cinco de Mayo! Lots of excuses to type with the letter "M" today. 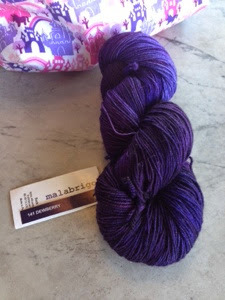 Today I dug up this lovely hank of Malabrigo in dewberry sock yarn. Honestly, it hurts a little to set this one free, but I have another hank of another purple Malabrio or um, 2 in the stash. How much does a slow knitter really need? I want to spread some knit happiness and you guys make me knit happy all the time. Would you like to give it a home? Can you envision a pattern with it? 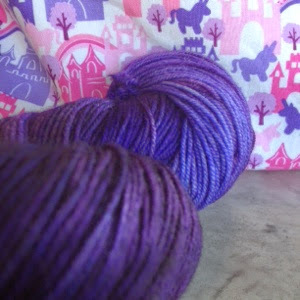 Leave me a comment with some way of getting in touch with you (like a Ravelry handle) in this post by end of day next Monday, May 12th and maybe it can be yours! Thanks for all your nice comments about my family and our food. You're right I'm lucky to have such a thoughtful family. The weekend felt good after shaking off that "edgy anxiety" as Karen put it so well -- that was exactly how I felt! I think we found a good balance of doing things and relaxing a bit. It was a productive weekend for me, which was really nice. I kept some spring sorting going, getting 2 bags of clothes off to Goodwill and sorted 2 stacks of books for donation and sell back. 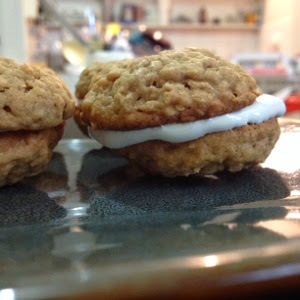 I followed the recipe and used store-bought marshmallow creme. I really couldn't be bothered with making my own filling. It is very important to freeze these so they set if you do not eat them immediately. They begin to ooze! (I am not sure just how long they need to come to room temperature, we pulled these from the freezer before our Sunday match so they were out covered in the sun for about an hour and a half, and held up OK) The PW thoughtfully prewarns of this condition with the marshmallow fluff, and offers another option in her recipe. It's been a long week. You know the kind for whatever reason leaves you with lingering anxiety even when it's over. I woke up today thinking it was Friday, again at 5am. (Maybe I just needed to go to the bathroom really bad!) I lay there thinking about what I can do on Monday to avoid this weird leftover Friday feeling next week. Not all leftovers are bad! I was going to meet Denise after work for a few hours before she went to a school fundraiser. She forgot her knitting so we were thinking some oysters and lemonade at hogs and rocks. Unfortunately Denise had her own set of Friday leftovers at work and had to power through. Sad but not dejected since I know we will rally together soon, I went home. Now the boys were supposed to have leftover dinner. I told them I was coming home and trying to find an excuse to not have leftovers. Dice and mash trout in a mixing bowl. 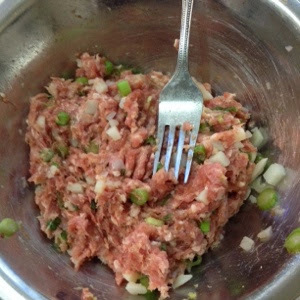 Add chopped green onions, squeeze *some of the lemon in. Mix. Add cream cheese and mix thoroughly. Add Tobasco and Worcestershire sauce to taste. 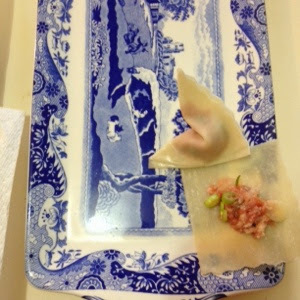 Portion into ramikins and cover with plastic wrap and set in fridge for an hour or two to set. Serve with baguette slices, breadsticks, Triscuits, crackers, toast points etc. 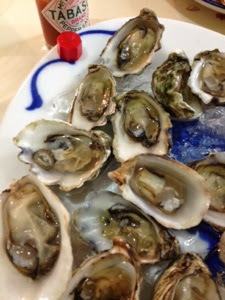 a great appetizer to tide friends and family over while you try to get dinner off after a long day. I like to make mine with the peppered trout I don't need to season it as much. 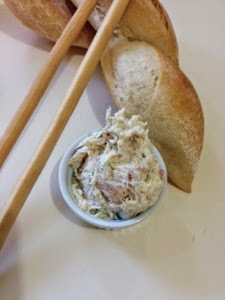 My pals prefer it with smoked mackerel and call it mackerel pate, hold the onions and add a tiny bit of nutmeg. Snack options!